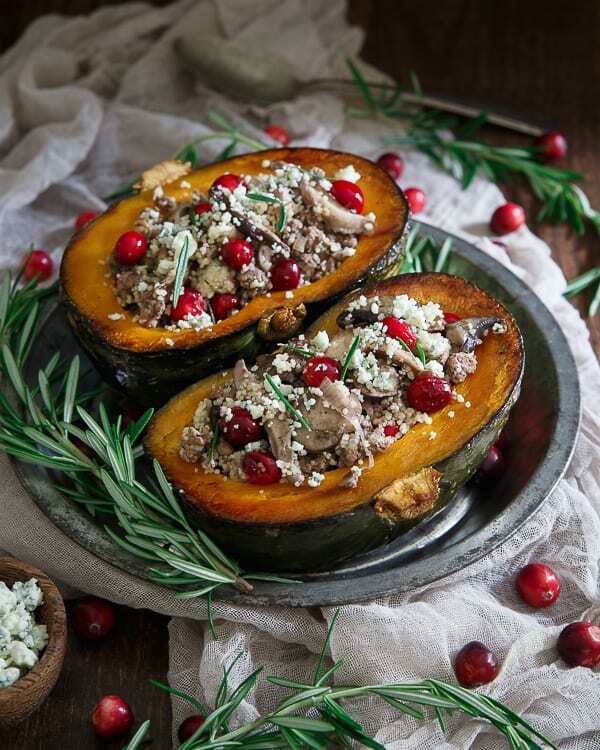 Lamb stuffed kabocha squash is filled wild mushrooms and couscous, fresh cranberries, blue cheese and aromatic rosemary. It’s the best fall has to offer on your plate. I know this recipe doesn’t scream “dairy!” (more like “oh, hello, fall you’re kinda pretty”) but hey, it has some blue cheese in it and I’m gonna roll with that. Why? Because I’m talking about my trip to Cleveland last month thanks to the American Diary Association Mideast. With a packed agenda to learn all about Ohio Dairy Farmers, cheese making and some of the education programs the ADA Mideast partners with schools on we set off on our first visit of the day to Richman Farms in Lodi, Ohio, a smaller sized farm with a milking parlor of about 20. The Indoe family talked to us about how the cows live, the creature comforts they’re provided (content cows produce better/more milk! ), the sanitary processes they go through during milkings, what they eat, how the milk is filtered and stored until the milk truck picks it up and pretty much everything and anything else we asked them about. After Richman Farms, we headed off to Pearl Valley Cheese, another family owned business that’s been around since 1928 making award winning cheeses, their Swiss being what they’re most known for. It was interesting to hear and see first hand how they take the milk provided from local dairy farms and turn it into their cheeses. We also ate our weight in samples from their store and all bought huge hunks of Colby, Swiss, Muenster and more home with us that I’m still making my way through. Since we were in the heart of Amish country at this point and it was lunch time, we actually stopped to eat an authentic Amish cooked meal at the house of a local Amish family. It was a feast of a lunch that included one of the most amazing breads I’ve ever tasted in my life. It was soft, slightly sweet and served with this peanut butter/maple syrup/marshmallow spread that was pretty much as epic as it sounds. We all pretty much rolled out of there and back onto the bus for our last stop of the day, Andreas Dairy Farm. The Andreas farm was a much bigger operation than our morning visit. With about 1,000 cows it was a whole different perspective. The common theme though, even with 900+ more cows than Richman Farms was keeping the cows healthy and happy. Talking to the farmers and seeing the care and concern they have for every animal on the farm while still maintaining it as a business was both heartwarming and incredibly reassuring especially on the bigger farms. 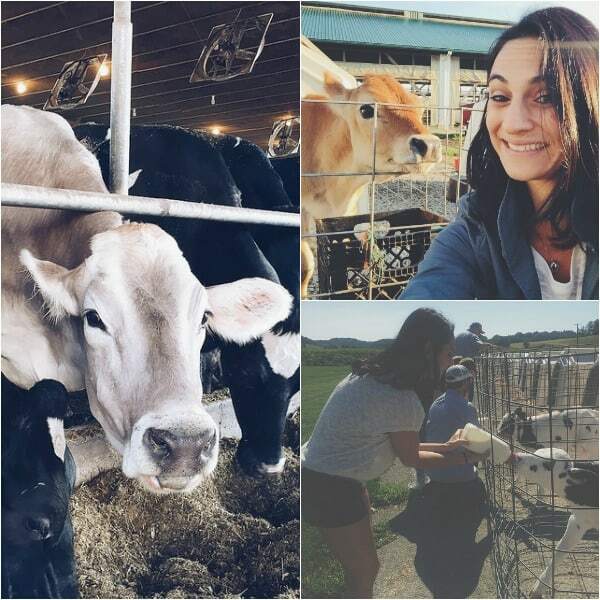 When terms like “factory farm” are thrown around, I think many assume that farms of a certain size just stop caring about the animals and that was definitely not the case at Andreas Dairy Farm. Due to their size, their calves are kept at a separate facility, just a mile or so down the road with their own dedicated staff. We got to visit them as the last stop of the day and bottle feed calves that were just a day or so old at that point. Basically, 80+ pound babies sucking a bottle from your hands, it was definitely a memorable experience. The last event of the trip was a dinner at The Cleveland Browns stadium with tackle, Joe Thomas. Not only is Joe hysterical (we discussed his love of The Bachelor all throughout dinner), tall and handsome, he’s also the spokesperson for the the Fuel Up to Play 60 program that empowers kids to improve nutrition and physical activity (lord knows we need more of that in this country!). We even visited a local school the following morning before heading home and met with student ambassadors of the program. Their principle talked to us about the school’s efforts to encourage kids to eat healthy through school meals and the successes they’ve been having with the program. 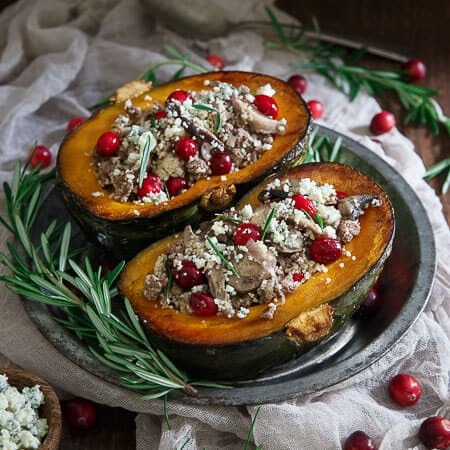 Needless to say, it was a fun, informative and inspiring trip and while I have a ton of delicious Pearly Valley Cheese to eat in my refrigerator, I’m sharing a slightly different dairy in this wild mushroom couscous lamb stuffed kabocha squash recipe, blue cheese. The combination of fall flavors of the squash, cranberries and mushrooms just pair a bit better with a pungent blue cheese. Plus, I don’t think the cows discriminate…it all comes from milk somehow! If you love stuffed squash, check out this oldie but goodie, apple lentil stuffed acorn squash or, for the kabocha lovers like me, don’t miss this kabocha squash soup. 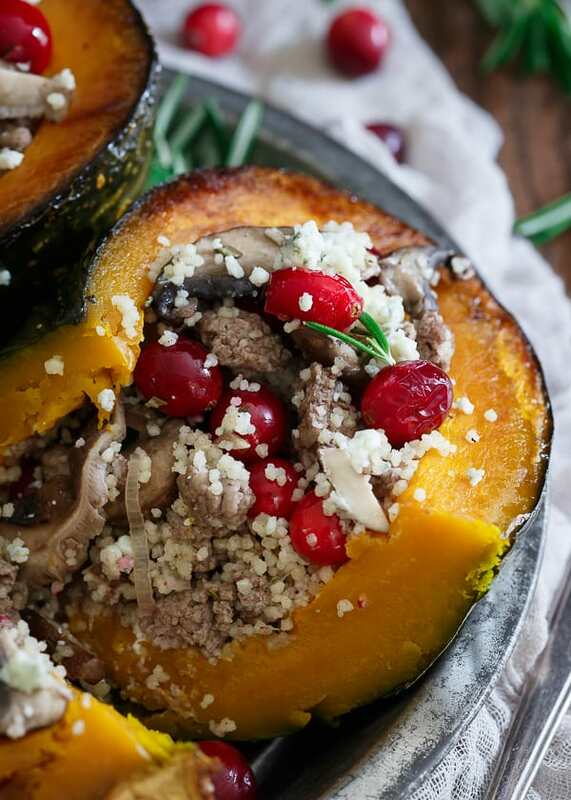 Sweet roasted kabocha squash is stuffed with wild mushrooms, couscous, lamb, fresh cranberries, blue cheese and aromatic rosemary. It's the best fall has to offer on your plate. Drizzle 1 tablespoon of the olive oil on the flesh of the kabocha squash. Place squash flesh side down on a baking sheet and roast for about 40-45 minutes until softened. Remove from oven, turn squash over so flesh is facing up and let cool. Meanwhile, heat the remaining tablespoon of olive oil in a large skillet over medium-high heat. Add the shallot and garlic and saute 1-2 minutes until softened. Add the mushrooms and rosemary to the skillet, stir and then let cook for about 5-7 minutes until softened. Add the lamb to the skillet, breaking apart with a spatula and cook until browned. Drain any excess fat from the skillet and return to heat. Add the mushrooms back to the skillet then add the cranberries and cook another 1-2 minutes just until cranberries are heated through. Season with salt and pepper to taste and turn off heat. Cook the couscous by bringing 1 cup of water to a boil in a small sauce pot. Once boiling, add couscous, cover and remove from heat. Set aside for 5 minutes. After 5 minutes, remove the cover, fluff with a fork and add the couscous to the skillet with the mushroom and lamb mixture. Add the blue cheese crumbles to the skillet and toss to combine. Spoon the filling into each kabocha half. *Thanks to the American Dairy Association Mideast and Ohio Dairy Farmers for sponsoring my trip to Ohio. It was such a fun trip and great to see you again! I love this recipe! I was just telling my husband that I don’t make lamb enough. Being Lebanese it is a huge part of our family get togethers. I have to try this! This looks soooo good I’ll definitely have to try it. I love squash and mushrooms, so I have no doubt It will be great! Great pictures. This is literally one of the most perfect recipes I’ve ever seen! Not only is it beautiful, but it combines all of my favorite foods! 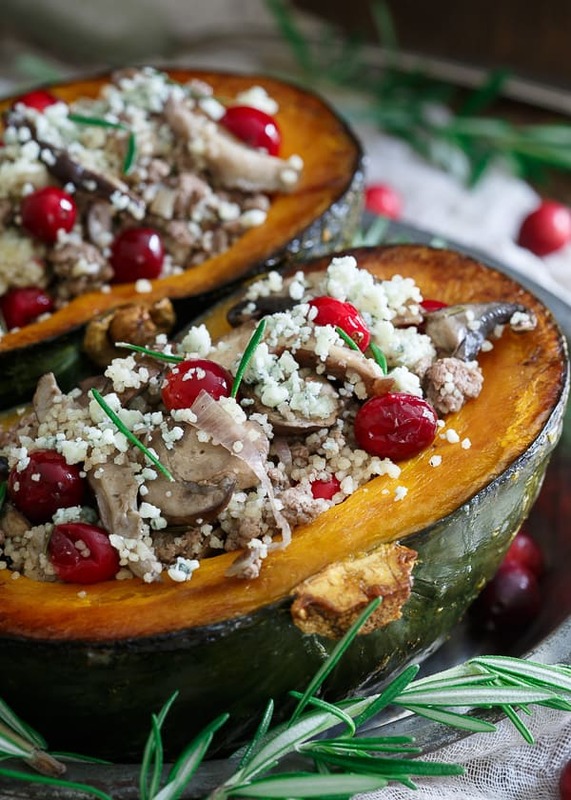 This dish is so festive heading into November! Plus being able to your bowl is extra fun! Completely stunning, Gina!! I’m so glad you had a good time in Ohio!! This is a delicious recipe! We made it fall 2016 and again fall 2017. The flavors come together so nicely. We substitute cauliflower rice for the couscous. Thanks for sharing!